I put together my quilt blocks from our bee inspired quilting bee, and I am having some serious doubts about my choice of layout, I kinda wish I would've used some sashing. Oh well, I don't ever redo, so hopefully I'll like it more once it's quilted and bound. It's amazing! You don't need the sashing! I think it is perfectly lovely!!! I really like it w/out sashing - I like how the blocks seem to point at each other, like following a maze. I love it! It has a very vintagey feel to it. Absolutely wonderful without the sashing. I think it is perfect! I love it!! But them I "heart" flying geese. I wouldn't change a thing even if you were someone to redo things. It looks good without the sashing! I know how that goes though thinking you should of done something else once youve already pieced the whole thing together. It looks lovely! I bet it looks nice close up with all those cute wee prints. It is lovely the way it is! No sashing needed!! It looks great! I never saw such a layout for flying geese, and I love it! No way, this quilt has such movement, I love it. If it was mine (and I know full well it's not) I would add another border with more triangles on blue. That's mostly because I'm not generally a border person so that dotted border jumps out at me. I LOVE it!! I think it's perfect without the sashing. Great job!!! Well if you don't like it you can always send it here, I think its just gorgeous the way it is! Well done on finishing! I concur with everyone else: it's simply smashing just the way it is. Nah, I think it looks fabulous without sashing! Go with it... you may just love it when its all done! ooooh I like it! I have been getting bored of seeing everything sashed recently. It is fun to see the different patterns the blocks make next to each other. It looks beautiful! I don't think it needs any sashing. When I use sashing it is usually to frame a block. Yours looks like little fishies swimming around in a wintery pond. I love it! I love the carefree feel to it; the lack of perfect order is exactly what I love. I think it's great! I tend to shy away from triangles because my flying geese usually end up having a cut off beaks. Good job! It looks great! what a happy quilt. it really lifts my mood thanks for sharing. I like it! It's fun and scrappy. I hope you end up liking it too! I love it as it is! The blue solid really binds it together! So many lovely prints and colors, so sweet and fun twist on traditional blocks! Great quilt! It looks great with or without sashing! I love it exactly that way it is without the sashing. It is so pretty! I like it, especially where the like sized geese meet up! I really love the layout. I agree with Cheryl though. I would love to see another border with flying geese. I think it would really add something to an already great quilt. oh, i love this! i think it looks spectacular! i think it's cool! i like the blue background. about the sashing....I think it is just oh so perfect like it is...well done....I.LIKE. Oh my word. I think this is my favorite Bee quilt ever. It's just stunning! I love the pale blue background color you chose. 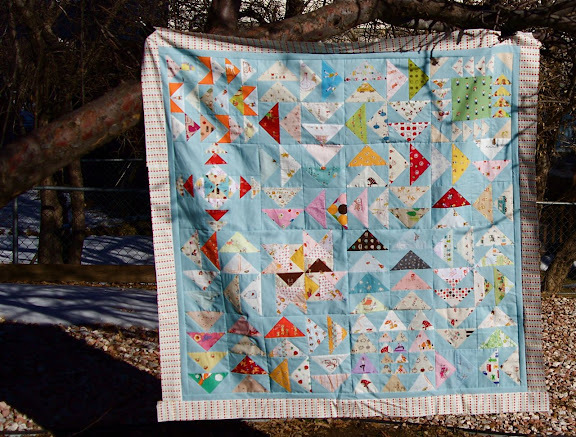 I like this quilt, the light blue make it very soothing and comforting. I think it is great! I think it's look great. Nettie, this one is SO cool! It reminds me of one of those blankets little kids drive cars on. It is like a maze, so creative!! no! I love how the background floats all the fabrics and pieces of the blocks. Oh, I think it is lovely as it is! I think the trouble is that there is not that much contrast in it, too many cream colored prints were used, and the whole pattern has been lost. Perhaps you wanted a quilt that was more subdued but I think contrast can really make or break a good quilt pattern. Just my two cents...no harm intended. 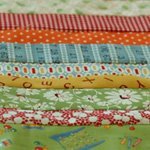 I especially like all the pretty fabrics that flow throughout your quilt. Simply lovely, dear. Sashing would have been nice; and, the current layout is great! Either, or your quilt top is fabulous! No, it's lovely and keeps your eye moving!